McLaren and Mercedes-Benz have today announced their new realigned long-term strategic alliance. The deal includes the engine supply for the next 6 Formula 1 seasons (2010-15) and also provides mechanisms whereby the partnership may continue beyond 2015. 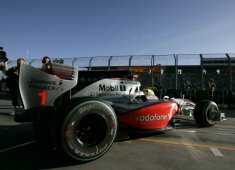 The reaffirmation of the two companies’ commitment to each other is the result of many weeks of careful and co-operative discussion between the McLaren Group and Daimler AG (the parent companies of, respectively, McLaren Racing and Mercedes-Benz) and covers both parties’ continued involvement in the Vodafone McLaren Mercedes Formula 1 partnership as well as a shared intention to act in the overall best interests of the sport of Grand Prix racing. It also reflects the independent vision of both companies with regard to their automotive production strategies. Having begun in 1995, the McLaren/Mercedes-Benz partnership is already one of the longest engine-supply associations in Formula 1 history; 2009 was its 15th consecutive year and 2015 will be its 21st consecutive year, by which time it will have become by some margin the longest such association in Formula 1 history. Both the McLaren Group and Daimler AG were therefore committed to securing its continuation as part of a realigned long-term strategic alliance, and to have provided mechanisms whereby the partnership may continue beyond 2015. The team will continue to be known as Vodafone McLaren Mercedes, its distinctive silver-with-red livery will remain unchanged, and Mercedes-Benz will continue as both an engine supplier and a partner. In a transaction structured so as to be completed by 2011, the McLaren Group will undertake a phased purchase of the 40 per cent shareholding currently owned by Daimler AG. As a result, the McLaren Group will become a fully independent stand-alone corporate entity. The McLaren Group will continue as the parent company of McLaren Racing (and Vodafone McLaren Mercedes), McLaren Marketing, McLaren Electronic Systems, McLaren Applied Technologies and McLaren Electronics Inc (USA), focusing chiefly on Formula 1 and associated technologies, while McLaren Automotive has been spun out of the McLaren Group and from 2011 will begin to manufacture its own range of high-performance production sports cars, targeted to penetrate a series of meticulously-selected premium automotive market segments. As such, McLaren Automotive will continue to develop according to a robust business strategy that has been formulated with McLaren’s customary prudence and rigour. The McLaren Group and McLaren Automotive will continue to evolve in line with their respective business strategies, and may in time adopt slightly different shareholder groupings, but they will always share a common goal: to be the best in the world in their respective fields. “This is a win-win situation, for both McLaren and Daimler. “I’ve often stated that it’s my belief that, in order to survive and thrive in 21st-century Formula 1, a team must become much more than merely a team. That being the case, in order to develop and sustain the revenue streams required to compete and win Grands Prix and World Championships, companies that run Formula 1 teams must broaden the scope of their commercial activities. “Nonetheless, all of our partners will of course continue to play a crucial role in our Formula 1 programme. For that reason, and because the engines they produce are very competitive, we’re delighted that Mercedes-Benz has committed to continue not only as an engine supplier but also as a partner of ours until 2015 – and perhaps thereafter. “The next few years will be a very exciting time for McLaren, during which period we intend to become an ever-stronger technological and economic force. Formula 1 will always be a core activity, for sound business reasons as well as for historical sporting reasons: to be clear, our Formula 1 business has traditionally enjoyed great financial security, largely as a consequence of the longevity of our contracts with our partners, many of which have exceeded 15 years of continuous involvement with McLaren. Indeed, two of our partners have been with us for more than 25 years.